That’s a normal HB pencil. Identifying these little guys was a bit of a challenge. The Lone Pine field guide to Mushrooms of Ontario and Eastern Canada is an excellent reference in terms of providing good colour photos and info on the different species, but it contains 609 species of mushroom and fungus, and these are only just a selection of the most common species likely to be encountered. I couldn’t find a species in the book small enough to be this one, but I narrowed it down to a couple of likely genera, and then did a Google search. 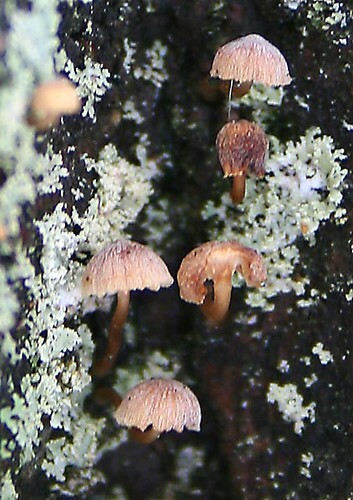 I’m reasonably certain the species is Mycena corticola, also called “Bark Mycena” because it grows exclusively on bark, usually freshly fallen or declining living trees. 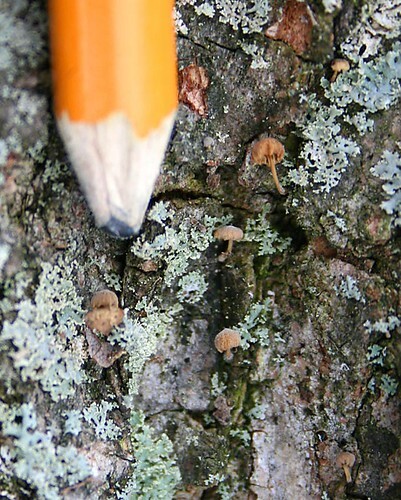 Unlike many mushrooms that grow on live trees, this one doesn’t damage its host, as it doesn’t reach deep enough into the tree to affect the tree’s food transportation system. It’s often found in association with lichen or moss, such as it is here. It is “marcescent”, meaning it has the ability to dry up when moisture is low, and come “back to life” after precipitation or fog. I took the second photo, with the pencil, today and the first photo yesterday, and you can even detect between the two a bit of drying – the mushrooms in the second photo are browner and look a little shrivelled in comparison; I had some difficulty finding a good patch to take the photo of. This may also be in part due to age – they probably came out during the warm spell last week, and the purpleish colour eventually fades to brown as they age. Mushrooms are hard to find at this time of year since most of them don’t grow under layers of snow. Fungus, however, is easier to come by. 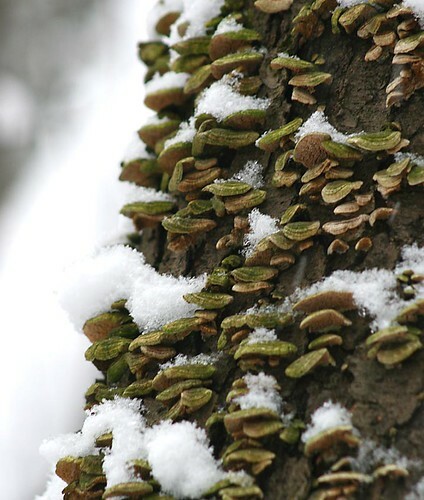 Undoubtedly the easiest to locate in the winter are those large fungal growths that you usually find secured to the side of a rotting stump or log. 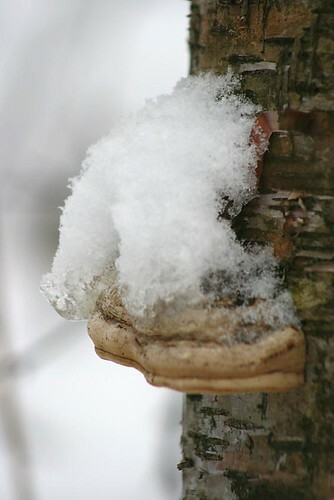 They’re called “bracket fungus”, or sometimes “polypores” because they have many (“poly”) tiny pores on the underside of the growth to release reproductive spores, instead of the “gills” we associate with mushrooms (what you see when you flip a mushroom over and look at the underside of its cap). I believe the above photo is of Fomes fomentarius, a common and widespread bracket fungus. Its common name is “Tinder Polypore”, after its historical use as tinder for starting fires. If hammered flat it’ll smolder for a long time without much heat, and before matches were invented was often used to transport fire (for instance in nomad societies; in fact, “The Iceman” had a piece of it, along with some flint, in a pouch he was carrying). It was also used as a primitive medical tool and has been shown to contain certain substances, such as iodine, that prevent bacterial growth. It grows commonly on birches, and indeed all the ones I found in the woods were on birch. This is another type of bracket fungus, I suspect Cerrena unicolor. One of the frequently mentioned identification features is that C. unicolor is whiteish or brownish in colour but is frequently greenish due to a layer of algae growing on top, which is clearly the case here. This species has an amazing relationship with a couple of wasps, the horntail wasp (genus Tremex) and ichneumonid wasp (genus Megarhyssa). The horntail wasp female carries around spores of C. unicolor in her ovipositor, and when she lays her eggs in the bark of a tree, the spores are deposited with it. The spores begin growing into the bracket fungi in the photo, and in doing so create a large network of fungal “roots” (called “mycelium”), which the horntail larvae feed on during their development. When the larvae pupate, they absorb some of the spores into the pupa, which are then incorporated into the female wasp’s ovipositor during development to allow the cycle to continue. Now, I don’t exactly understand why the fungus does this next part, but perhaps it’s to keep the larvae from eating it out of house and home (the mycelium are its connection to its food source, after all). 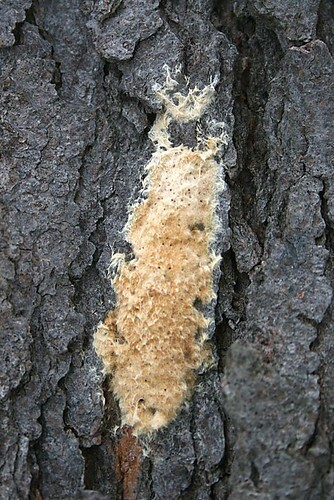 The fungus will produce a pheromone that attracts ichneumonid wasp females, who come and lay their own eggs. When the eggs hatch, the larvae parasitize the horntail larvae. Whoda thunk all that was quietly going on under those fungal growths? Edit: It’s been suggested to me that this is actually a gypsy moth egg mass, and after looking it up, I think that’s correct. This is one pitfall of identifying something yourself, particularly in an area that’s new to you (like fungi). The description in the fungus field guide was a pretty good match, and the image, although small and difficult to discern details, sure looked like it. Perhaps this is the moths’ camoflauge technique? :) In any case, I’ll leave the text as is, for the information on slime moulds (which should be correct regardless of the identity of the above). Here’s one last fungus to close off this post. I just happened to spot this blob of creamy brown on the trunk of a tree as I was leaving the forest yesterday. At first glance it looks like someone thwacked the bark with a wet fluffy cattail head, or it might be something a cat threw up (though getting it five feet up a tree would be a feat even for an ambitious cat). It actually belongs to a group of fungi called “slime moulds”, which are fungi that lack the defined shapes we tend to associate with the group. Similar to the fungi that grows on the forgotten leftovers in the back of the fridge, it’s often (though not always) a large blob of roughly uniformly-coloured stuff (for lack of a better word).I’m not sure of the particular species of the above specimen, but there are only some 500-odd species in the world, most of which are very widespread, indicating that, evolutionary speaking, they’re all very old. They have two life stages. The above is the “fruiting” stage, where they produce spores to carry on the next generation. Their first life stage is as a “plasmodium”, a slime (from which they take their name) that is not often seen as it usually resides in rotting logs or other decaying matter. When it comes time to spread their seed, however, they need to move to a better location where the spores can be caught by the wind or otherwise dispersed. The crazy thing is – they move like amoebas, crawling across surfaces to find a good fruiting location, ingesting organic particles in their path and ejecting ones they can’t eat. All at a rate that would make a snail look like a cheetah, however! As a result, they don’t move far, usually just a couple metres at most. And I’ll leave you with this food for thought: slime mould has recently been shown to be able to navigate a maze, connecting two points through the shortest possible distance to food – perhaps an example of primitive intelligence in a fungus? In Bill Bryson’s book A Short History of Nearly Everything (which you should read! ), he talks a bit about slime moulds. From what I recall, he said that a certain type of them tend to live individually, but when times get tough they group together and grow into a multi-celled organism that moves to find better resources. And then when times are good, it’ll group together to grow a flower that will develop spores or something that are caught on the wind and are distributed to go live in other areas. Very cool stuff. Reading that book, and reading this, I wonder why we couldn’t learn this kind of stuff in Biology class in school, rather than all the boring technical details that I personally find really boring. I’ve read other books by Bill Bryson, and enjoyed them, so I should pick that up. I agree that they need to teach more interesting stuff in Biology. I’m sure even if the students didn’t actually go into the field you’d capture the attention of more of them and develop more of an apreciation for the natural world – something that seems to be lacking in today’s culture. Jennifer – you know, I think you’re right. Just goes to show, one’s always learning! The funny thing is, it looked just like the (albeit small) picture in the field guide, and the description matched, too… Guess I’ll have to keep on looking. it does look rather like a fungus, i must admit!